Elevation data can be derived from the stereo image pairs using photogrammetry algorithms. A stereo pair is two images of same area taken from different angles at different geolocations. The stereo image pairs of an image collection are used to generate a point cloud (3D points) for which elevation data can be derived. The 3D points generated from stereo pairs in the DEMs wizard are classified to two categories: ground (bare earth) and above ground (buildings and trees). The elevation data derived from points of a ground type is called DTM and elevation data derived from points of above ground type is referred to DSM. The derived elevation will be used to orthorectify the image collection in the ortho mapping workspace. Elevation can be derived when the image collection has a good amount of overlap to form the stereo pairs. Typical image overlap to produce point clouds is 80 percent forward overlap along a flight line and 60 percent overlap between flight lines, so that every location on the ground is covered by multiple images. It is often used in processing drone images, digital aerial images, or certain satellite images captured specifically for stereo applications. Generate point cloud to construct stereo pairs from the image collection, in order to compute the point cloud. Interpolate a raster at a user defined resolution from the point cloud. You can modify the default processing parameters, but you cannot remove a step. If you wish to perform a specific step, you can use the Custom wizard. The first step is specifying the parameters for the Point Cloud Settings page. ETM (Extended Terrain Matching)—is a feature-based stereo matching in which the Harris operator is used in detecting feature points. Since less feature points are extracted, this method is fast and can be used for data with less terrain variations and detail. A search radius that is used to filter out objects above ground. Objects smaller than the threshold will be filtered as ground, otherwise objects will be treated as above-ground features such as buildings, bridges, or trees. Defines the spacing, in meters, at which the 3D points are generated. The suggested spacing is five times the source image pixel size. The point cloud is generated from stereo pairs. This value, in degrees, defines the minimum angle the stereo pair must meet. A stereo pair with too small of an intersection angle will produce unstable results when triangulating 3D points. The point cloud is generated from stereo pairs. This value, in degrees, defines the maximum angle the stereo pair must meet. A stereo pair with too large of an intersection angle will produce few or no match points. The percentage of overlapping area over the whole image. The default is 0.6. The maximum threshold for the Omega/Phi difference between the two image pairs. The Omega values and Phi values for the image pairs are compared. If the difference between either the two Omega or the two Phi values is above the threshold, the pairs will not be formatted as a stereo pair. 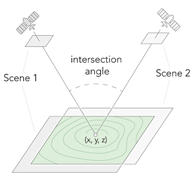 The threshold for the maximum ground sample distance (GSD) between two images in a stereo pair. If the resolution ratio between the two images is greater than the threshold value, the pairs will not be built as a stereo pair. The number of pairs used to generate 3D points. For a project that has dense overlaps and many stereo pairs, increasing this number means more computation time. The suggested value is 4. Sometimes a location may be covered with many image pairs. In this case, the tool will order the pairs based on the various threshold parameters specified in this tool. The pairs with the highest scores will be used to generate the points. This parameter limits one pair to be used too many times. The parameters that affect the order of the stereo pair, besides Minimum Intersection Angle, Maximum Intersection Angle, Minimum Area Overlap, may also include Maximum Omega / Phi Difference, Maximum GSD Difference, and Adjustment Quality Threshold. Specify the minimum adjustment quality that is acceptable. The threshold value will be compared to the adjustment quality value that is stored within the stereo model. Image pairs with an adjustment quality less than the specified threshold will receive a score of 0 for this criteria and will descend in the ordered list. The values for the threshold ranges from 0 to 1. The suggested value is 0.2. Heiko Hirschmuller et. al., "Memory Efficient Semi-Global Matching," ISPRS Annals of the Photogrammetry, Remote Sensing and Spatial Information Sciences, Volume 1-3, (2012): 371-376. Hirschmuller, H. "Stereo Processing by Semiglobal Matching and Mutual Information." Pattern Analysis and Machine Intelligence, (2008). The second step is specifying the parameters for the DEM Interpolation Settings page. Create a digital terrain model or a digital surface model. DTM—Create a digital terrain model by interpolating only the raster surface using ground only points. DSM—Create a digital surface model by interpolating a raster using all the points; both ground and above around points. The cell size of the output raster dataset. The method used to interpolate the output raster dataset from the point cloud. TIN Linear Interpolation—Also known as triangulated irregular network (TIN) linear interpolation designed for irregularly distributed sparse points, such as solution points from block adjustment computation. TIN Natural Neighbor Interpolation—This is similar to triangulation but generates a smoother surface and is more computationally intensive. Inverse Distance Weighted Average Interpolation—This is used for regularly distributed dense points, such as point cloud LAS files from the Generate Point Cloud tool. The IDW search radius is automatically computed based on average point density. Select a filter to smooth the output raster dataset. Gaussian 3 by 3—A Gaussian filter with a 3 by 3 window. Gaussian 5 by 5—A Gaussian filter with a 5 by 5 window. Gaussian 7 by 7—A Gaussian filter with a 7 by 7 window. Gaussian 9 by 9—A Gaussian filter with a 9 by 9 window. No smoothing—No smoothing filter is applied. A DEM input that is used to fill NoData areas. Areas of NoData may exist where stereo overlap is insufficient, or no matching points are found in the area during point cloud generation. The generated DEM will be used to refine the orthorectification of the image collection. If you do not wish to replace the current elevation model with the newly generated DEM, you can uncheck the option. This parameter will update the orthorectification process in the Image Collection. Check on the check box only when you are sure that the DEM output is acceptable and you do not need to re-generate it again. If you have generated DEM without it checked on, you can apply the resulting DEM for orthorectification when you use Orthomosaic wizard.